There are also individual words that can have different implications. A WISE man and a WISE guy are completely different. 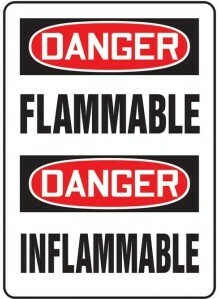 "Inflammable" can mean a substance that can burn, or can't burn. Sometimes the Latin prefix "in" (also "em" and "im") means pretty much the same thing as the English "in." An inflamed arm is hot and red, i.e, as if it is "in flames." However, the Latin prefix "in" often means "not," as in "incredible," "insufficient," and "inimicable"
In an online discussion yesterday, someone said that his company works "OUT of the Atlanta area." While this is a hillbillyism meaning that the company is based in the Atlanta area, the meaning would be pretty much the same if he said the company works IN the Atlanta area. And, of course, we can DRIVE on a PARKWAY and PARK on a DRIVEWAY.